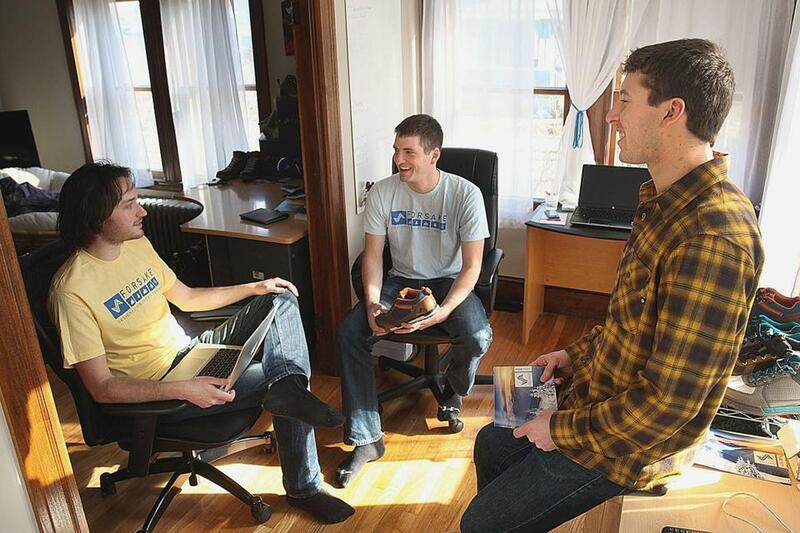 From left, Forsake partners Jack Knoll, Jake Anderson, and Sam Barstow discussed their company in their Allston apartment. The Forsake shoe brand started when Sam Barstow and Jake Andersonworked at mountains out West and got tired of their feet getting soaking wet from slogging around on the snow-covered slopes. Barstow, 24, said he and his friends preferred the style and comfort of low-cut skateboarding shoes, but they were a poor choice for winter conditions. “We wanted to create a footwear option for young people that don’t identify with hiking boots, but still live this outdoor style,” Barstow said. So they started Forsake in 2010 to sell waterproof sneakers that are as durable as boots. Now located in Boston, Forsake is one of a number of startups emerging in a region that was once the shoemaking capital of the world. Operating on a shoestring budget, many of these young businesses are taking advantage of Internet fund-raising sites to crack an industry that usually requires big money to get started. Unlike New England shoe giants such as New Balance Athletic Shoe Inc. and Converse Inc., these new companies are not trying to make mainstream products. Instead, they are targeting niches of the vast shoewear catalogue, from custom-embossed boat shoes to sandals with fanciful braided rope, from waterproof sneakers to boots that are as comfortable as running shoes. And by turning to popular online crowdfunding sites such as Kickstarter.com for financing, these entrepreneurs are connecting directly with like-minded consumers. Operating out of a cramped Allston apartment, Barstow and Anderson made pitches to at least 50 investors and got only seven willing to provide the initial funding to get the company off the ground. A Kickstarter campaign proved a bit easier. In 38 days, they raised about $116,000 from more than 1,000 backers in 2012. Matt Powell, a shoe analyst with SportsOneSource, agreed the shoe market is especially difficult to crack. Building a shoe company from the ground up involves “tremendous costs,” and brands typically need to sell hundreds of thousands of pairs to make a profit, Powell said. The shoe industry in Greater Boston thrived in the 19th and early 20th centuries until globalization shifted manufacturing to developing countries. Similar to most major shoe companies today, the startups design their own shoes but have them manufactured at overseas factories. Powell said the production system gives bigger players an advantage because they can manufacture in greater bulk and offer lower prices. “These large brands are so capable of making shoes and getting to scale quickly, it really makes it difficult for small brands to make money,” he said. Justin Kittredge left his position as Reebok’s director of basketball products for footwear a year ago to start a boutique maker of slides: sandals with adjustable flaps, typically sold by athletic brands. But instead of the Nike Swoosh or Adidas stripes printed across the flap, Kittredge’s company, iSlide in Norwood, allows customers to choose their own graphics. Kittredge makes his slides with a softer footbed, which he believes is more comfortable than those from other brands. The shoes retail at $50 for a customized pair and less for bulk orders. The New York Knicks placed an order for slides with their logo, as did Northeastern University. The company made a pair for New England Patriot Duron Harmon — with his nickname “DHarm” and his jersey number, 30 — and some for Boston Celtic Kelly Olynyk that are customized with his nickname, “The Klynyk,” a silhouette of his signature long hair, and jersey number, 41. Now Kittredge is in talks with other retailers that want him to develop and produce slides for their brands. Another industry veteran, Joe Prew, left behind a 30-year career at New Balance, Timberland, and Nike Inc. to start a company selling comfortable leather boots. Prew and Lyons founded the Reading-based Boston Boot Co. and set out to raise $25,000 in a Kickstarter campaign last year; within a month they had nearly $250,000. The first production order of about 5,000 boots, which retail for about $200, will be delivered in late March from a small factory in China. Boston Boot Co. presold about 2,000 pairs, and the remaining boots are for sale on the company’s website. Another new shoe company, Category 5, makes and sells boat shoes that can be customized with letters or logos. The founder of the Framingham company came up with the idea because he wanted to have a pair of boat shoes embossed with the Greek letters of his fraternity. The shoes are priced between $90 and $138 and are sold online and in a handful of retail stores along the East Coast. Cape Cod Shoe Supply Co., of Boston, founded by veteran shoe designer Juliette Bench, is making flip-flops with the top straps modeled after those sailor’s knot bracelets worn by kids on the Cape in the summer. Her sandals are on sale in about 80 retail stores, including Nordstrom, and priced at $39.50 for adult sizes and $29.50 for children’s sizes. “It’s part of a democratization process going on, which I describe as making the dreams of the Internet real,” said Mollick, the UPenn professor.